Slider 80mm 8.3g Color: Neon Core Gold. Stickbait 98mm 13.8g Color: Spook Killer. 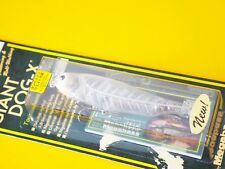 Floating pencil bait 98mm 13,9g Color: White Coach. Slider 80mm 8.3g Color: NC Flashing Shad. Slider 80mm 8.3g Color: M Tennessee Shad. Slider 80mm 8.3g Color: NC Avocado. Floating pencil bait 98mm 13,9g Color: Albino Raigio. Popper 78mm 14g Color: Il Sirius. Floating pencil bait 98mm 13,9g Color: Laser Beam. Slider 80mm 8.3g Color: M Deadly Back OB. Slider 80mm 8.3g Color: M Bass. Walking Bait 80mm 8.4g Color: Spook Killer. Slider 87mm 3/8oz Color: Wagin Honmoroko. Stickbait 98mm 13.8g Color: GG Wakasagi. Popper 64mm 7g Color: GG Shad. Slider 80mm 8.3g Color: NC Tequila Shad. Slider 80mm 8.3g Color: VR. Popper 64mm 7g Color: GG Midnight Black. Stickbait 98mm 13.8g Color: Rising Sun 2. Floating pencil bait 98mm 13,9g Color: GG Shad. Slider 80mm 8.3g Color: Il Sirius. Popper 64mm 7g Color: Rising Sun. Stickbait 98mm 13.9g Color: PM Kawamutsu. Stickbait 98mm 13.8g Color: GG Midnight Black. 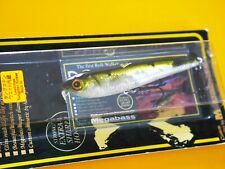 Suspending minnow 95mm 11g Color: MG Deadly Black Il. Stickbait 98mm 13.8g Color: GG Perch. Slider 80mm 8.3g Color: Karakusa Tiger. Slider 80mm 8.3g Color: Crack Bomb 2. Stickbait 98mm 13.8g Color: GG Oikawa Male. Walking Bait 80mm 8.4g Color: VR. Slider 80mm 8.3g Color: Neon Core Pro Blue Ver 1.